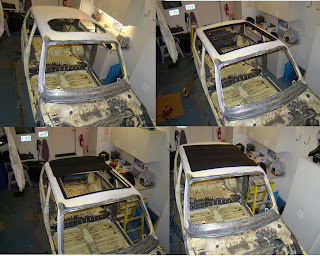 It's been part of the original vision of the car to cut out most of the top and install a sliding ragtop similar to those found on original Mini Coopers. Around six weeks ago, I ordered just such a top from a company in Arizona called, Street Beat Customs. They told me it would take six to eight weeks to receive, as they would have to custom make it to the 35x37" dimension that I wanted. It actually only took about a month, and with a few weeks for me to get around to it, I finally fired up the jigsaw. The original sheet metal that makes up the roof is very thin and has almost no integrity. I'm hoping that adding the aluminum frame of the slider will add a considerable amount of rigidity, because it would be impossible to straighten anything on the top of this little car as it is.